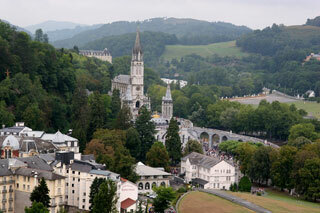 Lourdes is a small market town lying in the foothills of the Pyrenees. It is part of the Hautes-Pyrénées department in the Midi-Pyrénées region in south-western France. Prior to the mid-19th century, the town was best known for the Château fort de Lourdes, a fortified castle that rises up from a rocky escarpment at its centre. In 1858 Lourdes rose to prominence in France and abroad due to the Marian apparitions seen by the peasant girl Bernadette Soubirous, who was later canonized. Shortly thereafter the city became one of the world's most important sites of pilgrimage and religious tourism. This article uses material from the Wikipedia article "Lourdes", which is released under the Creative Commons Attribution-Share-Alike 3.0 License.